TORNADOES KILLED at least 23 people in Alabama on March 3rd, causing catastrophic damage as winds of up to 270 km (170 miles) per hour ripped apart rural towns in Lee County. Such severe weather events, especially hurricanes and heat waves, are projected to become more intense in the coming decades as the temperature of the earth warms, according to a report from the United States Global Change Research Programme. As natural disasters get worse, their impact is likely to inflict growing economic damage alongside environmental costs. Moreover, the burden is likely to be greatest on people who are already struggling economically. A team of climate and economic researchers led by Solomon Hsiang of the University of California, Berkeley, released a report in Science in 2017 that attempted to quantify the economic impact of various levels of warming. Current policies put the world on track to warm by anywhere between three and four degrees Celsius relative to pre-industrial levels. The scientists also examined warming as low as 1.5 degrees (the aspiration of the Paris climate agreement of 2015) or as high as five degrees (which could occur if planned decarbonisation policies are not implemented fully). The authors took the three global-warming scenarios and combined them with other data to show what they could mean at the local level. They started by predicting weather patterns for each of America’s 3,143 counties. Then, they estimated how those weather patterns would impact agricultural yields, energy usage and other variables like crime and labour markets. From there, they predicted how changes in these factors might affect the size of the economy in various regions. Forecasting tens of thousands of possible outcomes from different warming scenarios and local factors, the researchers charted the expected effects on economic conditions. Making predictions this far into the future invariably requires making numerous assumptions that may not come to pass, and the range of plausible outcomes surrounding the resulting estimates is extremely large. Nonetheless, the picture in the most likely scenario looks grim. 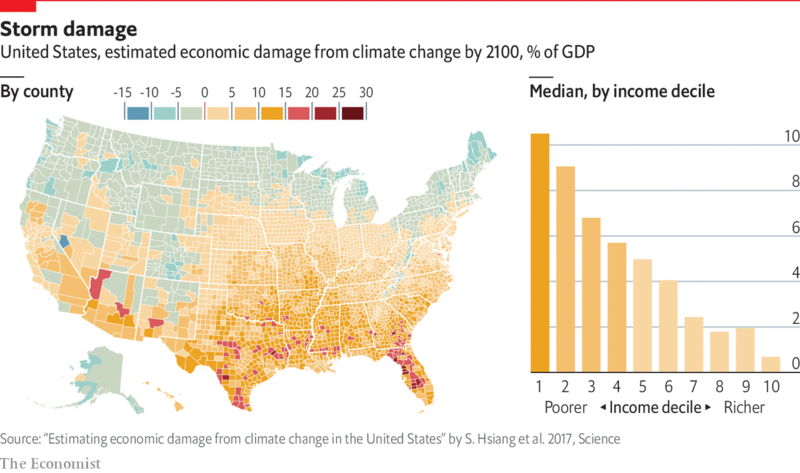 The scientists estimated that three degrees of global warming would cost the median American county 4% of its GDP, relative to what that area would otherwise produce without any additional warming, by the end of the century. This figure would rise to a loss of 6% or more with five degrees of warming, and fall to below 2% if the globe warms by 1.5 degrees or less. The impact on some individual counties could be much larger. In particularly poor regions—such as counties around the fifth percentile of the national income distribution—the lost output accounted for 10% of GDP, and in the most affected county it reached 28%. In contrast, counties at the 95th percentile of income are expected to face losses of just 0.7% of GDP. Why is warming likely to exacerbate regional inequality in America? The simplest explanation is that wealth tends to be correlated with latitude. Poor, rural parts of the South and Midwest rely on agriculture, and are already heavily exposed to the impact of heat on energy bills and heat-related mortality and crime. These factors matter far less in northern and western states. All coastal regions will suffer from rising sea levels, but hurricanes are more common along the already-impoverished coastlines of the Gulf states, Georgia and the Carolinas than they are further north. Moreover, those areas will not benefit as much as their cooler northern counterparts will from offsetting benefits of warming, such as lower heating costs in the winter. Many American counties in the north are actually predicted to gain more than they lose from rising temperatures. They tend to be places that are already doing well economically today.